'Tis the season to be jolly Fa-la-la-la-la la-la-la-la! Or at least it soon will be. In anticipation of a jolly festive period, we're putting together a beer advent calendar so that yours (or your partner / sibling / friend / co-worker / postman) will be extra special. 24 days of advent and 24 beers in a case is just too much of a coincidence. 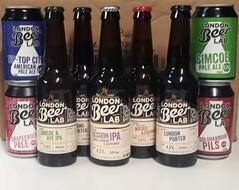 The London Selection as the name may suggest will contain a range of beers from breweries around the capital. A variety of styles from pale to dark and everything in between. The Hop Box Selection, with no regional restrictions, will be an exploration of pales, IPAs and anything else that truckloads of hops have been thrown at. Whether 24 days will be enough to shift your lupulin threshold, we just don't know but it'll be a lot of fun finding out. This is strictly a pre-sale product - deadline for orders is the 16th of November. Beer boxes start dispatching on the 26th and 27th of November to allow no conceivable circumstance that beer won't be sitting chilled on the 1st day of advent. If you've nuts / lactose / other allergen is a big no no, let us know in notes to seller. FREE SHIPPING to England and Wales - but if you'd like to reduce the carbon emissions of your advent beer box you can opt to collect in store from the 26th of November. Strictly over 18s and courier may require identification at delivery point.